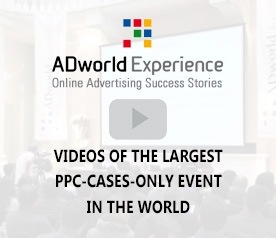 Here is the interview Sergio Borzillo released to us about the case history he will expose at ADworld Experience on April 17, 2015 in Bologna (or via live streaming). Sergio is the head of PPC at NetBooster UK, one of the leading SEM Agencies in Great Britain (and part of a group operating in 70 international markets with more than 450 in-house experts). What will your case history be about exactly? What I truly admire about the evolving world of digital is that you are never short of topics to talk about and one that I particularly enjoy discussing is Google Shopping. Previously referred to as Product Listing Ads, Google Shopping Campaigns have changed the way consumers interact on search engines. Different from traditional text centric search ads of the past, shopping ads are now much more retail orientated. Using product images, retailers’ branding and promotional deals, you are able to offer the consumer a realistic impression of a product without them having to visit a website. We all know how an image can speak a thousand words – helpful when dealing with the character limitations that previously hindered us in traditional search ads. However, using this feature is not enough, it is important to ensure that only relevant products, with the correct information show what customers are specifically looking for. There are a number of common mistakes that advertisers make when approaching Google Shopping and the aim of my session is to share best practices on campaign strategy, data quality, ads management and tracking. If you should convince someone to come to listen to you, what would you say? With more than 100 online retailers being managed across the Group, NetBooster has a wealth of experience in handling successful Google Shopping campaigns, typically for medium to large organisations. We are experts with an insightful knowledge of the capabilities gained through tireless testing and thorough research. We have learned the tricks to make the most of each feature available to advertisers. Added to this is the great relationship NetBooster has with Google, affording us as a Group; a range of best practice developmental opportunities. As Head of PPC at NetBooster UK, my role is to develop PPC strategies for a variety of clients across multiple verticals. One of the biggest parts of my role is to ensure that PPC is not managed as a standalone channel but is truly integrated in the complex digital channel ecosystem. NetBooster is the leading independent digital agency focusing on performance driven digital strategies. We operate 21 global offices, handling blue chip clients from around the world; deploying digital campaigns and strategies with over 450 in-house experts, practicing in more than 70 international markets. More at www.netbooster.com. What would you like to be when you grow? Ideally to integrate the search channel more and more within the entire digital mix. Encouraging clients to think less and less in silo and more in an integrated and unified approach. To encourage clients to have at the core of their digital team, a data analyst, able to decode the information gathered from each channel and feed the key insights into the overall digital strategy. Thanks to Sergio for having shared with us some insights of his pitch at ADworld Experience on 4/17/2015. Look at the program of the conference or join us via streaming or live in Bologna (Italy).